Delicious King Prawns in a Tamarind Sauce. Best served with cooked rice. 1. Heat 1 1/2 tblsp butter in a pan over medium flame. 2. Add the shells, sliced onions, red chillies, garlic and tamarind paste. 3. Cook for 5 minutes. 4. Pour the stock and bring to a boil. 5. Reduce flame and simmer for 10 to 15 minutes. 6. Remove and blend until smooth. 7. Strain well and keep aside. 8. Heat 1 1/2 tblsp butter in a pan. 9. Add the prawns and cook for 4 to 5 minutes. 10. Pour the sauce and cook for a minute. 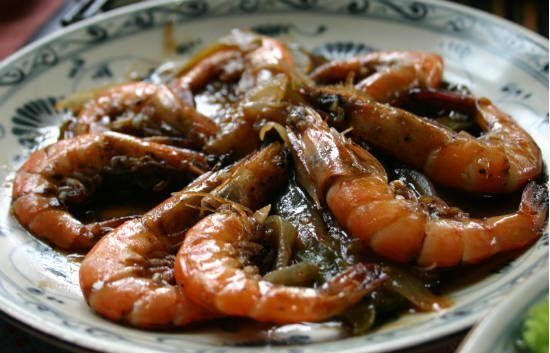 Feel free to comment or share your thoughts on this Prawns in Tamarind Sauce Recipe from Awesome Cuisine.